The dancing egg (L'ou com balla in Catalan) is an old tradition that takes place in several towns in Catalonia during the feast of Corpus Christi. The tradition probably started at the Cathedral of Barcelona. There is evidence from the 16th century that acolytes would place a dancing egg on the fountain of the Barcelona Cathedral's cloister. To accomplish this, the egg would have been emptied, with wax used to fill the hole and add some weight. When placed over a water jet from a fountain, the egg starts turning without falling, and thus "dances." 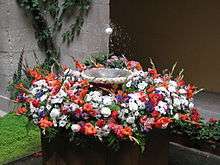 Generally, fountains with a dancing egg are also decorated with seasonal flowers and fresh fruits, like cherries, which cover the bowl of the fountain, as well as weaver's broom and carnations. From the Cathedral, the tradition also started at the patio of the neighboring Casa de l'Ardiaca (Archdeacon's House), and it spread to several other courtyards of the Barcelona city center beginning in the 1980s. More recently, other Catalan cities and towns assumed the tradition. In Barcelona a dancing egg is placed in several locations within the Gothic Quarter during Corpus Christi: Barcelona Cathedral the Casa de l'Ardiaca, in addition to the courtyards of the Ateneu Barcelonès, the Archives of the Crown of Aragon (at the Lloctinent Palace), the Royal Academy of Arts of Barcelona, Frederic Marès Museum, the cloister of the Monastery of Jonqueres (adjacent to the Puríssima Concepció basilica), Centelles Palace, and the History Museum of Barcelona. In Igualada the dancing egg is placed on Pius XII Square. In Sitges it is found at the Maricel Museum. 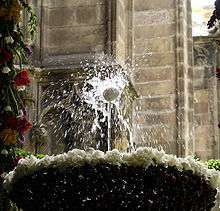 In Tarragona in 1933, the canon Dr. Josep Vallès Barceló began decorating the garden and placed a dancing egg on the fountain of the cloister of the Tarragona Cathedral. Its popularity grew, especially after the Spanish Civil War, with the assistance of the local officials. At present it is prepared by a team of volunteers, a volunteer florist and the cathedral sacristy. Wikimedia Commons has media related to Dancing egg. This article is a translation from Catalan entry L'ou com balla. This article is issued from Wikipedia - version of the 8/19/2014. The text is available under the Creative Commons Attribution/Share Alike but additional terms may apply for the media files.